It appears that the fledgling Alliance of American Football League may be in danger of folding operations before they really ever got off the ground. Or at least that what appears to be happening. It could very well be just another nationwide pageant to mislead the public while pursuing a completely different agenda. As per reports by Pro Football Talk, the AAF has suspended operations until further notice with the ominous quote ‘at least for the day, and probably indefinitely’, which sounds a lot like nobody really knows for sure what the hell is going on. Except perhaps for Dallas billionaire Tom Dundon, who, after investing $70 million in the new football enterprise and promising to come up with another $180 million or so to keep the league alive, has decided to shut it down. 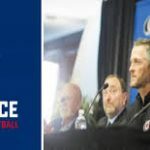 Dundon’s actions leave a lot of people scratching their heads, not the least of whom is AAF co-founder Bill Polian who told reporters, “I am extremely disappointed to learn Tom Dundon has decided to suspend all football operations of the Alliance of American Football”. So apparently the two original principals in the AAF were kept out of the loop then the decision was made to shut the league down, which seems a bit strange. The other co-founder Charlie Ebersol was equally baffled. So what happened? Did Mr. Dundon suddenly pull out a spread sheet and didn’t like the numbers? It seems like he would have run those numbers before forking across $70,000,000. Now he is ready to blow off that tidy sum. What could have happened in the interim for him to accept such a loss? But forget for a moment about the money. The real losers in this little pageant are the players and coaches whose hopes and dreams are invested in the new league. They weren’t making all that much money, but they were participating in the sport that they love and had invested so much time and energy for so many years. So, the AAF, its founders, coaches and players, and even the mighty NFL itself remain perplexed by Dundon’s abrupt actions. The controversy seems to be the inability of the AAF to come to terms with the NFLPA, the National Football League Players Association, concerning the use of NFL practice squad players by the new league. Surely this would mean more work for more football players. Surely the two sides can get together on such a small point holding up such a large enterprise. In the meantime, sportsbooks all across the country have taken down their odds on AAF futures. Of course the possibility exists that Tom Dundon is simply making a power play on the NFLPA and using his own $70 million to back his bluff. One popular speculation is that Dundon bought into the league simply to acquire the gambling app technology being developed by the AAF.